Rich Whip® Topping and Coffee Rich® Non-Dairy Creamer are high quality products with great taste and smooth flavor. Whether served in a comforting cup of coffee, a steamy bowl of soup or atop a tasty sweet treat, Rich Whip and Coffee Rich make your food and drinks that much better. 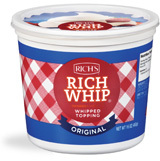 Embrace life's sweetness with Rich Whip® Whipped Topping. With its light texture and rich taste, Rich Whip® is a delightful finishing touch for any dish, dessert or pastry. Nothing says good morning quite like a delicious, aromatic cup of coffee. 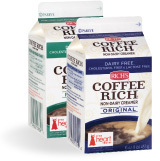 There is no better way to enhance the natural flavor of coffee than with Coffee Rich®.